Business Intelligence has always been one of the sectors of excellence of PRAXI’s IT Division, which boasts a successful history of over thirty years in the development and implementation of solutions in this area, using different technologies carefully chosen among the "best-of-breed" proposals of the period based on design and planning needs, with the constant goal of being able to propose the best application solutions. From the beginning of 2010, while maintaining its collaborations in previously covered technological areas, after a series of analyses on the technological, qualitative and innovative requisites relative to the proposals of the major vendors, PRAXI decided to undertake a strategic partnership with QlikTech Italia, having recognised the optimum technology in the Qlik platform for the fulfilment of cutting-edge solutions free from design and planning constraints from an application and performance point of view. Here, we analyse in more detail these three distinctive factors of the Qlik platform that, for several years now, have determined their positioning as leader in the Gartner Magic Quadrant for the Business Intelligence. 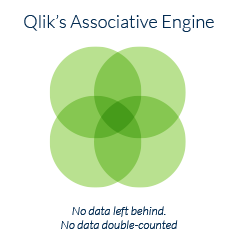 The Qlik platform is based on the concept of an "Associative Engine", which allows the creation of applications in which the entire set of data in the field, all connected to one another, is always available to the user. In this way, the data set can be analysed and browsed freely according to the non-predetermined paths, following the evidence and logical thread of the moment, often obtaining answers to questions that are not foreseen in the planning phase, and discovering hidden relations in the data. 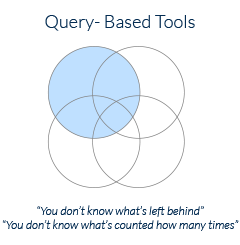 QLik allows to arrive at valuable intuitions of "data discovery", in an experience of a more and more effective use, both fluid and focused, which is precluded by the other technologies based on rigidly fixed a priori analysis paths and on a repetitive and fractional selection of incomplete portions of databases. 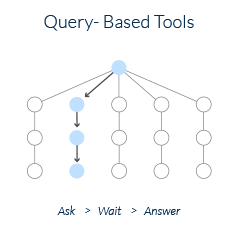 The associative method of the data analysis described is based on the in-memory engine of the Qlik technology that, through a “compression” process of the data, makes it possible to transport the whole analytical database into the RAM memory of the machine that hosts the application, eliminating the need for time-consuming periodic re-readings of the data subsets resident in remote Databases. The presence in the memory of all the data to be analysed guarantees surprisingly brilliant performance in querying and browsing, also in case of large amounts of data (when dealing with traditional large databases or Big Data). The high speed in the analyses and browsing of the data makes users’ experience extremely fluid and easy, eliminating the waiting phase that irritates users and distracts them from the analyses, sometimes causing them to abandon the solution. This setting also eliminates the need of continuous maintenance of the remote databases aimed at trying to maintain performance of adequate answers to the frequent queries. 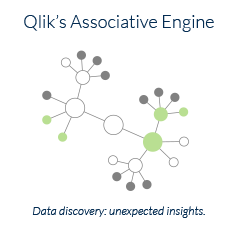 QlikView: founder of the Qlik suite, suited to the accomplishment of analytical institutional activities, distributed and consulted in the Web modality. Sense: Advanced Analytical tools, open to the mobile world (tablet and smartphone) and to users oriented to “self-service analysis”. NPrinting: the production and distribution of high-quality “pixel-perfect” Pdf and Office documents.